beautiful thorns: Perception is Everything! What we focus on in life makes all the difference in the world! What we focus on can either invite God's blessing into a situation or hinder his blessing. Do we look at a situation and see the majesty of God or adversity? Do we look at the world and see darkness or see opportunities for God's light to break through. Where sin abounds, grace abounds all the more (Romans 5:20). Yesterday, I took my children to the pediatric dentist. My kids had been called back and I was sitting in the waiting room, waiting. A teenage girl walked in by herself. She had several facial piercings, a black shirt with curse words and vulgarities all over it, and an expression that said, "Leave me alone! I hate you and I hate life." Understandably, I think most of the mamas in that room were shielding their kid's eyes. This girl ended up sitting near me. I felt the Lord's presence. I began praying for her. For a long time she would not look at me. Finally she looked at me and I was able to strike up a conversation with her. I smiled at her and said, "Interesting shirt." She replied, "Um, it's my friends." I said, "I bet your friend has had a hard life!" I then got called back so I couldn't talk to her anymore but hopefully through those few words, I was able to show her the Lord's kindness and understanding. Now, I could have looked at this girl as trouble, stayed away from her and kept to myself but I would have missed out on an opportunity and a "God" moment. The right mindset doesn't just apply to people we come into contact with in life, but even difficult situations we find ourselves in. A few years ago we went on a retreat as a family. The retreat grounds were beautiful! At first my kids were enjoying the beauty of nature all around us but then started noticing the bugs and started complaining. I told them not to focus on the bugs but God's beautiful creation. In that moment, God spoke to me that I have a tendency to do the same thing. I can often focus on the negative and fail to see what God is doing in a certain situation and see the opportunities that are available. Also take a lady bug for example. Some people will see the lady bug and see a pesky bug. 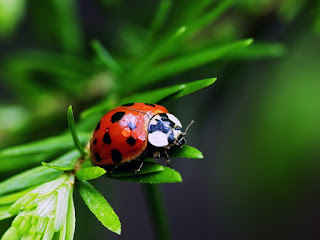 The lady bug is a also called a lady bird. Some people will see this creature as something beautiful. "You have heard it said, 'When life gives you lemons, make lemonade.' but I say 'When life gives you lemons, don't see the lemons as adversity, but see them as opportunity. Opportunity to encounter an aspect of my nature that you wouldn't otherwise have been able to discover." The majesty of God is bigger than any situation or circumstance we find our self in! As we allow ourselves to be transformed by the renewing of our mind (Romans 12:2), we can find rest for our weary souls in his sovereign majesty!